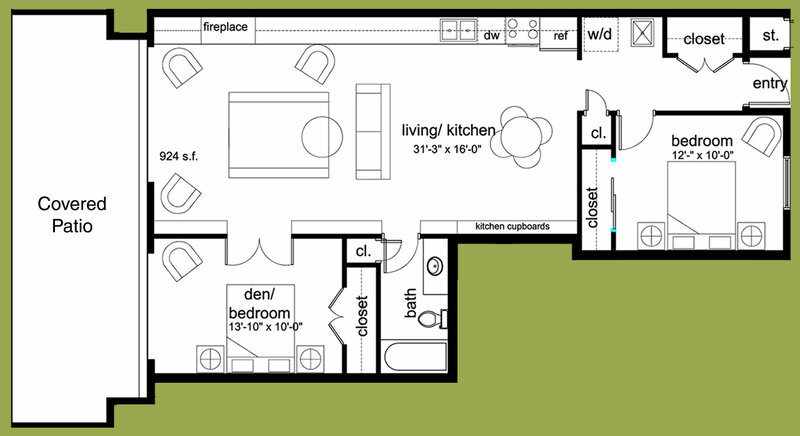 There are two of these loft layouts, one on second floor and one on the third floor . The covered balconies are approximately 300 square feet, more than twice as large as most of the units. perfect for watching the activity of the city, a tree top view of downtown Saint Joseph and the dome of the monastery. The units have large kitchens and dining areas with a gas fireplace, patio doors and two bedrooms; one with its own patio door, bathroom with a tub/shower unit, washer/dryer in unit, lots of sun and a private entrance. Square feet: Approximately 924 square feet. Plus a double sized covered balcony.